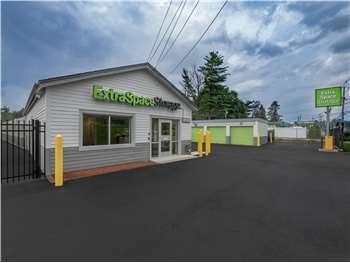 Located on Main St between Winter St and Nichols St, Extra Space Storage serves residents of North Reading, Ballardvale, Andover, and more. Locals will recognize our facility next to Napa Auto Parts. Extra Space Storage on Main St can accommodate residential and commercial storage needs in North Reading with a wide range of storage units, drive-up access, and exceptional security! No matter what you plan to store, our Main St storage facility has the perfect storage unit for you! Unit sizes range from 5x5 to 10x30 and include features like drive-up access and first-floor access. We've equipped our North Reading storage facility with security measures like 24-hour video surveillance and electronic gate access to provide a safe storage environment for our customers. Drive south on Main St. Pass North St and continue south. Our facility will be on your right after Lowell Rd. Drive north on Main St. Pass Walmart and continue north. Our facility will be on your left after Winter Rd. Drive west on Park St. Continue onto Winter St. Turn right onto Main St. Our facility will be immediately on your left. Drive east on Park St. Turn left onto Main St. Pass Walmart and continue north. Our facility will be on your left after Winter Rd.